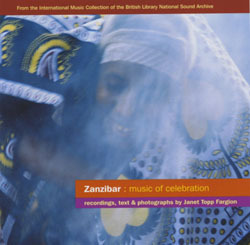 Taarab is the most common style of music performed at weddings on the island of Zanzibar – a unique blend of musical elements from the Middle East, India and the West, combined with, to varying degrees, local African musical practices. It is an essential ingredient of most celebrations. And when Zanzibaris are not playing taarab, they are playing maulidi. Although this is primarily a sober religious performance style (celebrating the birth of the Prophet Mohammed) it is also becoming common at wedding celebrations, albeit in a more extrovert guise. Here, recited chapters of the Koran are interspersed with kasida (hymns) accompanied on several tuned frame drums. These recordings, made at actual celebrations and in rehearsal for big events, give us a glimpse of the ethnic, religious, and gender composition of this Indian Ocean island culture.